Richard's SudokuSolver suggests an X-Cycle as the next step, but I don't know what that is--haven't even heard of it before. 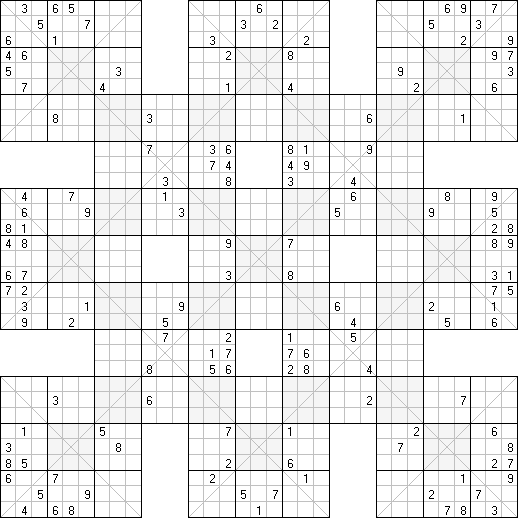 Ruud was always very conscientious to make all grids of a multi-grid puzzle of similar difficulty, so I find it hard to believe that I'm having this much difficulty with this one grid. Nvm. . . Finally got it. I guess I need to learn how to spot X-wings a little better. By the way, I've never seen an X-wing referred to as an X-cycle. Is that something new?